I remembered Red Tomato when it first opened at Mall Taman Anggrek, way back then. It's decision to relocate to Plaza Indonesia is indeed a smart move, but for what seemed like ages, it was stuck with the boring red and white decor concept. Despite hanging around at Plaza Indonesia almost every single day, honestly I never had the inclination to make a repeat visit ever since my high school days, when it was still nestled at MTA. 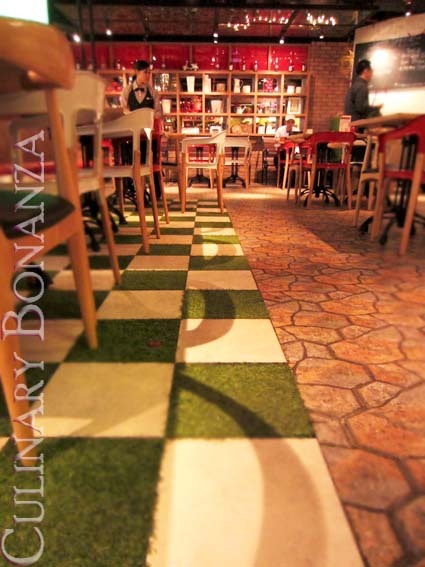 But last year, Red Tomato made a wise decision to revamp the interior decor and the restaurant concept. Say goodbye to the spartan Indonesian flag-like interior. Today, it has transformed into a pleasant indoor garden-like spot, replete with park benches and tables, synthetic grass and of course a touch of Red Tomato's signature colours: red and green. I have to admit that it creates an inviting niche that will no doubt tempt any passersby to at least take a peek inside. 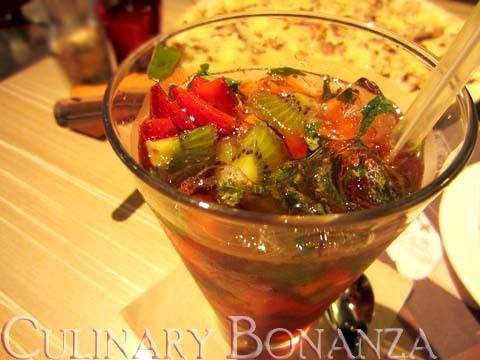 The menu itself is pretty typical for an Italian restaurant offerings, you can find such as pizza (savoury pizza and dessert 'Dolce' pizza), pasta, grill, risotto, platter, burger, soups, salads, appetizer, desserts and rather fancy beverages. Fortunately the menu comes illustrated, so you don't need play 'russian roulette' and hope that your choice turns out as you had expected or imagined. 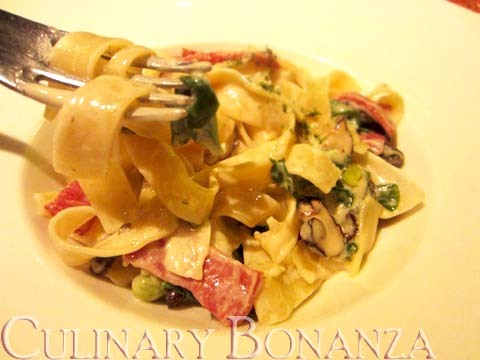 Firstly I had the Florentine Fettuccine Alfredo, which is 160gr of fettuccine, with alfredo sauce, baby spinach, beef bacon, shiitake mushroom & green peas. The alfredo sauce was not dripping or clumping together, it's a good sign that the cream sauce has reached perfect consistency level. It tasted good, but for taste buds that grew up with Indomie's MSG-saturated instant noodles (like me), the pasta is still missing something. 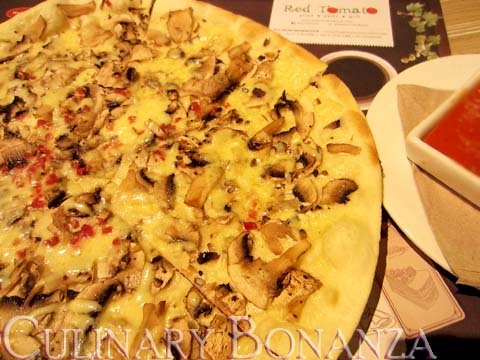 Red Tomato is perfect for health-conscious diners, who does not want to compromise taste over nutrition contents. Red Tomato cooks healthy food, shown by its commitment to use olive oil for everything and strict no MSG policy. Is this a park or a restaurant? 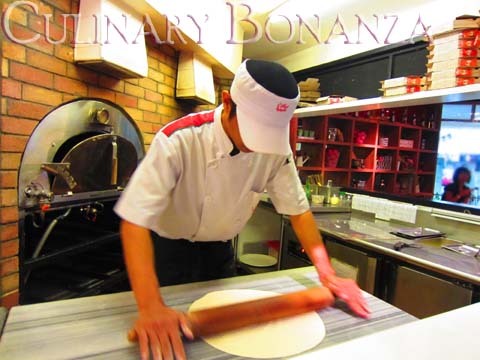 My pizza was being prepared on the spot, live! Hmm.. nice review Ellyna.. oh btw Irene, the pizza has beef bacon. They do have a lot other meaty pizza as well..
Hi Elvi, how nice to see you here! Thank you for your generous compliment...this is just a humble site, plenty of rooms for improvement.